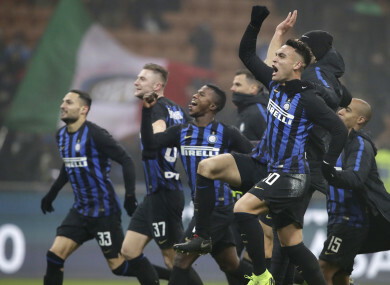 LAUTARO MARTINEZ CAME off the bench to earn Inter a hugely important 1-0 victory over nine-man Napoli in Serie A. The game appeared to be heading for a goalless draw before Martinez fired home from the centre of the box in additional time, with Kalidou Koulibaly having been sent off with 10 minutes remaining after picking up two bookings in quick succession. Napoli finished the game without Lorenzo Insigne too, the forward shown a straight red card for violent conduct following a confrontation with Keita Balde Diao. The win is just Inter’s second in five Serie A matches and eases the pressure on coach Luciano Spalletti. The match almost got off to the most dramatic of starts – Mauro Icardi spotting goalkeeper Alex Meret off his line and going for goal from kick-off. The crossbar came to Napoli’s rescue on that occasion yet Inter continued to pose the greater threat before the break, Carlo Ancelotti’s visitors not helped by the loss of captain Marek Hamsik with an apparent hamstring injury midway through the first half. Ivan Perisic had the ball in the back of the net after half an hour, picking up the pieces of Joao Mario’s blocked effort to rifle home, but the referee’s assistant correctly flagged for offside. Joao Mario headed straight at Meret seven minutes from half-time while Icardi failed to sort his feet out in time to score from close range, with Koulibaly sliding in to make a crucial block. Jose Callejon drew a save from Samir Handanovic with the first shot on target of the second half in the 66th minute, before Koulibaly was sent off for a pull on Politano that was quickly followed by a sarcastic clap – referee Paolo Mazzoleni brandishing his yellow card twice in a hurry to dismiss the defender. Icardi then had a headed effort kept out by Meret and penalty appeals for a foul on Keita went unrewarded. A frantic finish saw Kwadwo Asamoah block a Piotr Zielinski strike on the line before the breakthrough finally arrived, Martinez sweeping home after good work down the left by Keita. The drama was not done there, though, Insigne receiving his marching orders for an apparent kick on Keita, the Napoli forward continuing to squabble with the Inter substitute as he left the field. Email “Crossbar denies sensational Inter goal from kick-off before substitute snatches late victory over Napoli”. Feedback on “Crossbar denies sensational Inter goal from kick-off before substitute snatches late victory over Napoli”.